Digital music is a very promising sector in India, which is witnessing a robust growth since last few years. It is estimated that online music generates more than Rs 650 crore annual revenues inside India and in the year 2011, the sale of online music surpassed the sale of physical music albums for the first time in the history. Gaana.com, which is backed by Times Internet, is one of the major players in online music streaming industry. With as estimated 5 million monthly users, Gaana offers around 2 million songs spread across 84 languages and different genres of music. Recently, Gaana.com revamped itself, with the launch of Gaana 3.0 version for web and mobile platform. With some interesting features such as integration with social networks, inclusion of radio stations from all over the world, and customized and curated playlists, Gaana is all set to redefine online music streaming inside India. 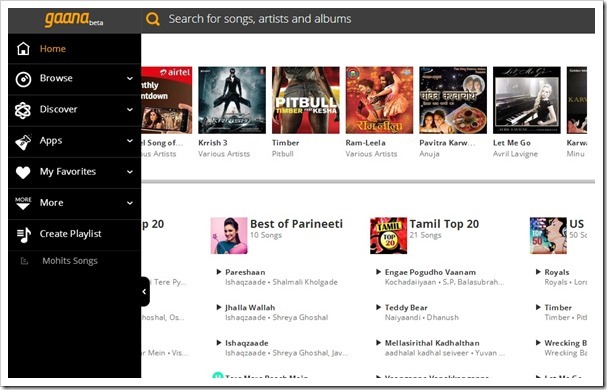 The new Gaana.com has been developed on HTML5 platform. Any specific reasons? We want our users to have a consistent experience across devices – desktop, tablet, mobile. Hence we chose html5 technology & responsive layouts, which enables us to adjust the look of page based on the screen resolution. Can a user download songs by paying a fee? Any plans of making this feature available on web in future? There is already a Gaana + feature on mobile apps, where a consumer can pay a monthly fee, and enjoy music, even without an internet connection. How do you plan to monetize your 5 million+ monthly visitors? Any plans of making this service paid in future? Gaana already has a paid service on Mobile, with features, like high quality files, downloading tracks, and listening to them without a connection and ad free. Can users create their own playlists? Yes, Gaana 3.0 gives listeners an opportunity wherein the consumers can create their own playlists. How can one socialize on Gaana? We have incorporated new social features, wherein one can follow other users and artists and see what they are listening to etc. Additionally users logged in through a social login, can see their friend’s listening activity. Who curates the songs and who creates the list? Do you also put up a song in the list just because an advertiser is willing to pay? At Gaana we do not compromise with consumer preferences, and tastes. The curation on the site is done by experienced, hands on, editorial teams. Which genre of music is the most popular among your 5 million listeners? Bollywood, as a category is the most popular amongst all. New Hindi film music is what the consumers prefer. Online music consumption in India is on a rise, we have seen the same increase at more than 50% year on year since the last three years, and with the internet penetration increasing at a fast pace, we expect this category to grow manifolds in the coming future. The new Gaana.com design and navigation looks promising; and the curated songs are no doubt best in the class. Although they haven’t exactly revealed how these songs are curated, and what makes them appear in top lists, but one thing is for sure: Gaana.com team understands music and wants music lovers to connect and enjoy better music on their platform. Do you listen to online music? How is your experience with Gaana.com? Do you want to share any feedback related to better experience of listening to music? Do share your comments right here! Indian IT Spending Pegged At $71.3 Bln in 2014; IT Services Growth Strongest!